The Villas On The Green is a picturesque neighborhood of 54 homes situated within the master-planned community of Forest Ridge in Broken Arrow, Oklahoma. Located on a par-72 golf course, residents of The Villas On The Green enjoy easy access to the golf club as well as the Forest Ridge Swim & Tennis Center across the street. A homeowners’ association (HOA) provides exterior home maintenance so residents have more time to take advantage of all the recreational opportunities available to them. Residents of The Villas On The Green enjoy proximity to the Forest Ridge amenities. The Forest Ridge clubhouse features its own restaurant, Cafe Savannah’s, where residents can grab a bite after a round of golf or they can bring there own lunch to eat in a sheltered picnic area. The clubhouse boasts several meeting rooms equipped with audio/visual capabilities and Wi-Fi capability. Right across the street from The Villas On The Green, The Forest Ridge Swim & Tennis Center features lockers rooms with showers and a patio area. A 25-yard swimming pool includes a cabana that can be rented for parties. There are four tennis courts as well as a sand volleyball court. The Forest Ridge Golf Course includes 18 holes and a driving range. When not hitting the ball around, residents take in the beautiful scenery with a stroll through the community’s hard-surfaced walking trails. Construction of the 54 units at The Villas On The Green was completed in 2001 and homes are available on a resale basis. These single-family homes range in size from 2,330 to 2,789 square feet and feature three or four bedrooms, two or three bathrooms, and two-car garages. These residences offer a first-floor master bedroom with extra living space on the second floor. They are highly customized with unique features, so no two homes are the same. Homeowners stay busy with the wealth of activities going on at Forest Ridge. In addition to golf, tennis, and volleyball, the master-planned community hosts special holiday events, a fishing outing, and two annual garage sales. With a HOA providing lawn care and landscaping, residents enjoy a low-maintenance lifestyle with plenty of free time for socializing and recreation. The Villas On The Green is located a short distance away from great amenities, both within and outside of the Forest Ridge area. Several parks can be found in the master-planned community, where residents can have a picnic or relax on a bench. Down Kenosha Street, plenty of dining and shopping options can be found. Grocery and drug stores are nearby as well. Tulsa is less than a half-hour drive away, where residents can find the Tulsa International Airport. 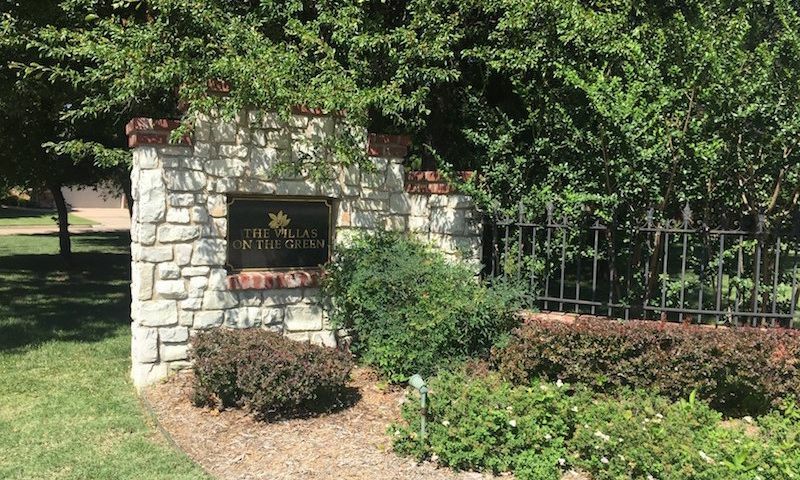 With great recreational amenities in a prime location, The Villas On The Green in Broken Arrow, OK offers homeowners the opportunity to relax and enjoy themselves in a low-maintenance community. Residents of The Villas On The Green enjoy access to all amenities at the Forest Ridge clubhouse. A swim and tennis facility right across from The Villas On The Green offers recreation and relaxation. There are plenty of activities available in The Villas On The Green. Here is a sample of some of the clubs, activities and classes offered here. Construction of the 54 units at The Villas On The Green was completed in 1999 and homes are available on a resale basis. These single-family homes range in size from 2,330 to 2,789 square feet and feature three or four bedrooms, two or three bathrooms, and two-car garages. These residences offer a first-floor master bedroom with extra living space on the second floor. They are highly customized with unique features, so no two homes are the same. 55places.com is not affiliated with the developer(s) or homeowners association of The Villas On The Green. The information you submit is distributed to a 55places.com Partner Agent, who is a licensed real estate agent. The information regarding The Villas On The Green has not been verified or approved by the developer or homeowners association. Please verify all information prior to purchasing. 55places.com is not responsible for any errors regarding the information displayed on this website.